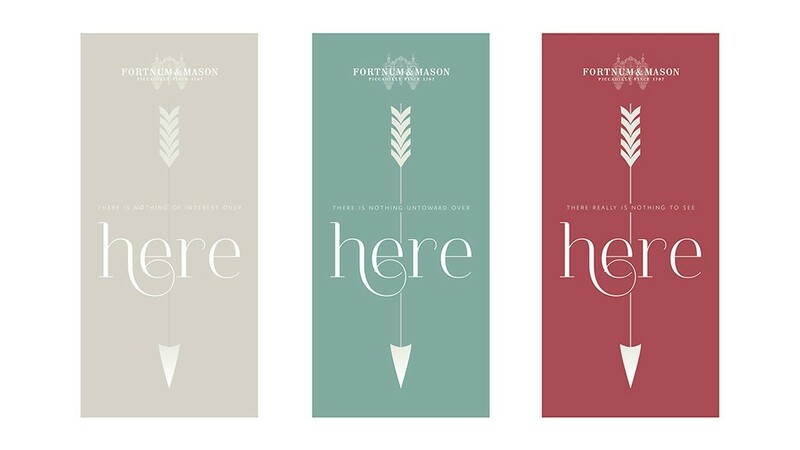 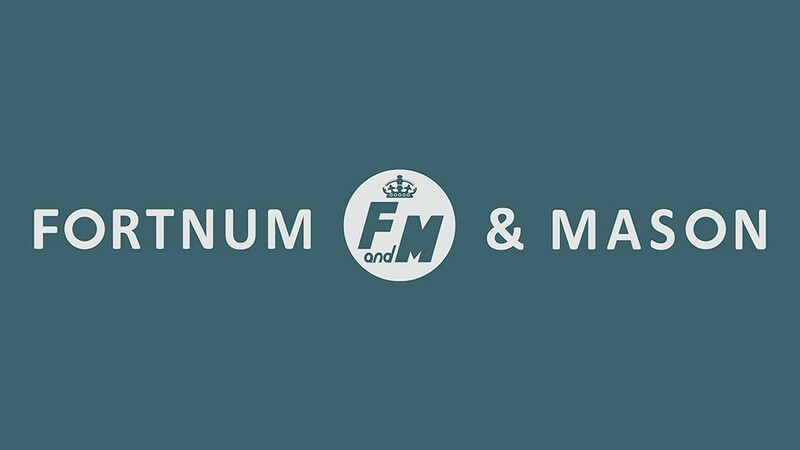 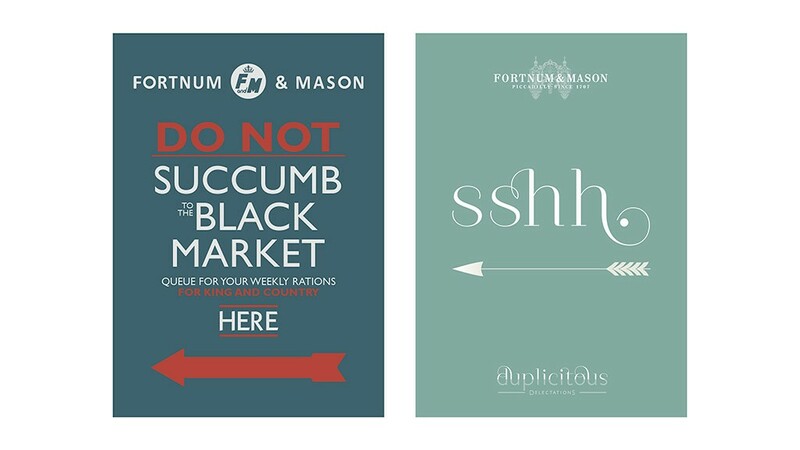 For my final university project I was tasked with creating a themed hamper for Fortnum & Mason, for which I chose to address (unsubstantiated) rumours that F & M were involved in trading on the WWII black market. 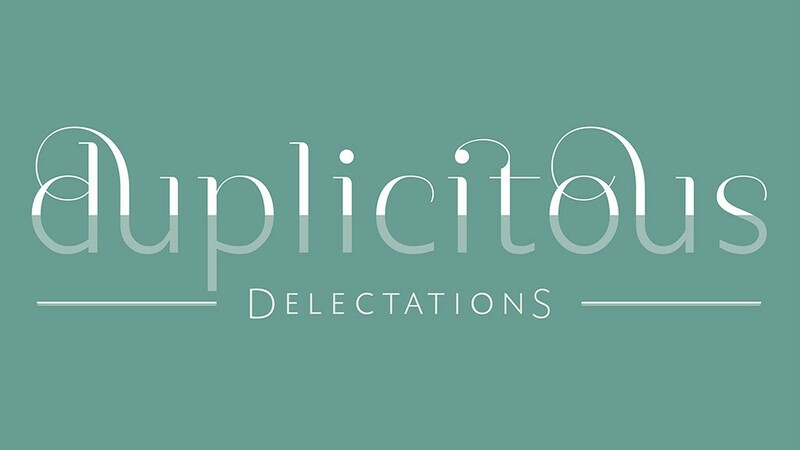 Therefore my theme was one of duality; the theoretical cover-up in store to disguise the sale of black market produce via the ‘Duplicitous Delectations’ hamper. 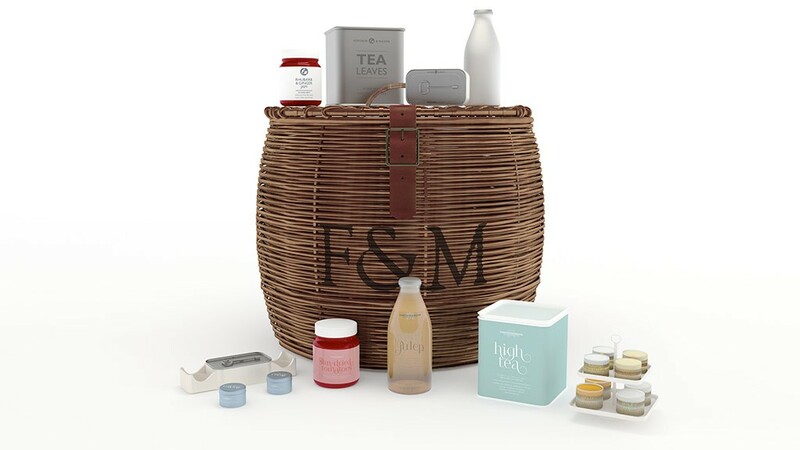 To achieve this, each aspect of the hamper and its promotions had a fake, austere ‘ration’ guise concealing luxurious and upmarket ‘black market’ contents within. 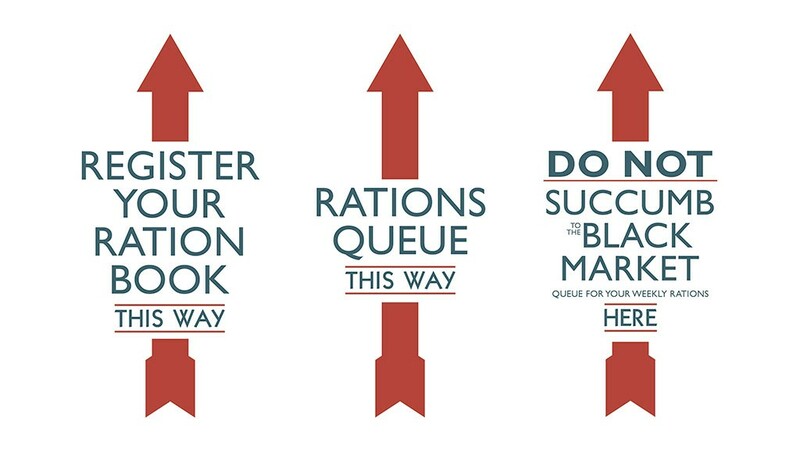 All the ‘black market’ products include decadent, luxurious and imported ingredients that would not have been available through legal means during WWII, whereas their fake ‘ration’ shells represent typically rationed items. 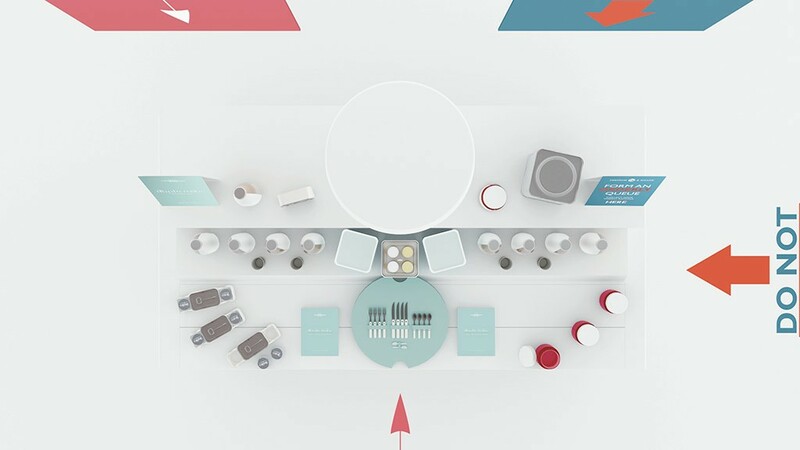 All work shown was rendered modelled and rendered in Blender 3D. 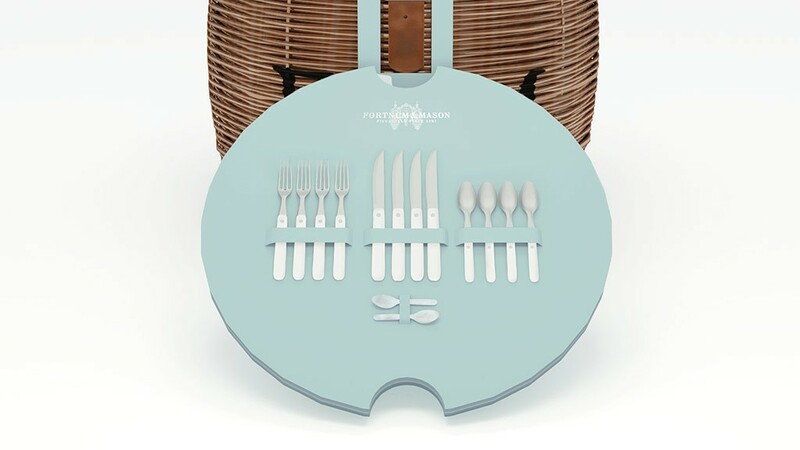 Within my hamper the ‘ration’ products are displayed on top of a coarse blanket, the underside of which is a modern picnic blanket in branded colours. 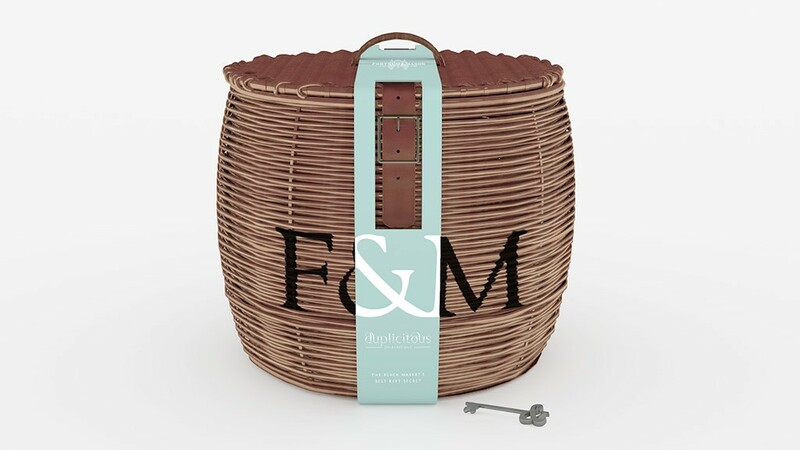 Removing the blanket reveals a secret hatch, unlockable with a key provided with each hamper. 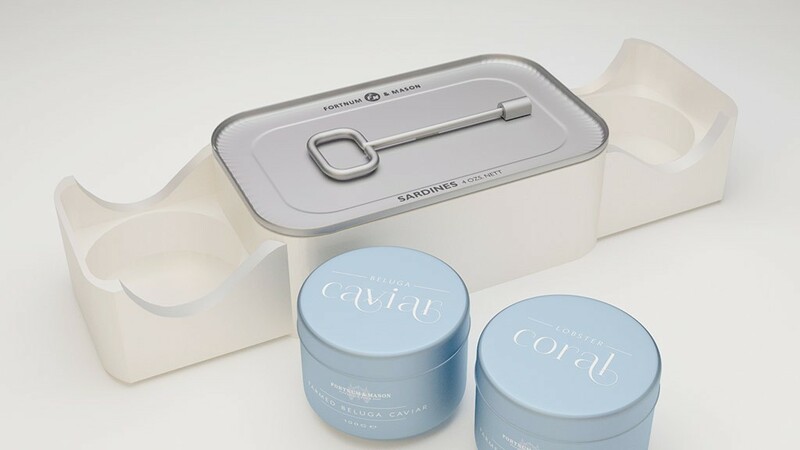 Once unlocked, cutlery (attached to the hatch lid), crockery and traditional Mint Julep cups are found within the secret compartment. 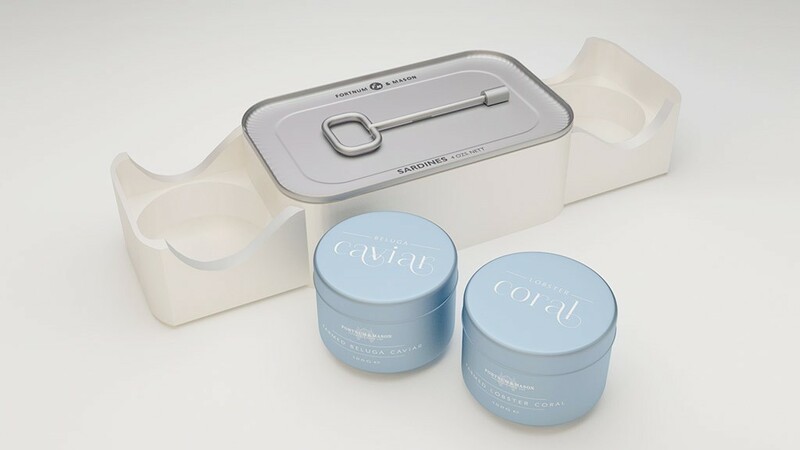 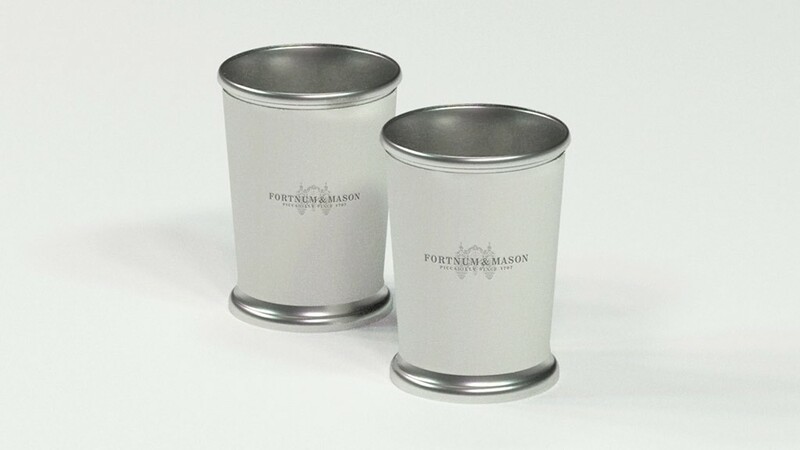 Cutlery includes mother-of-pearl caviar spoons and the cups are engraved with the F & M branding. 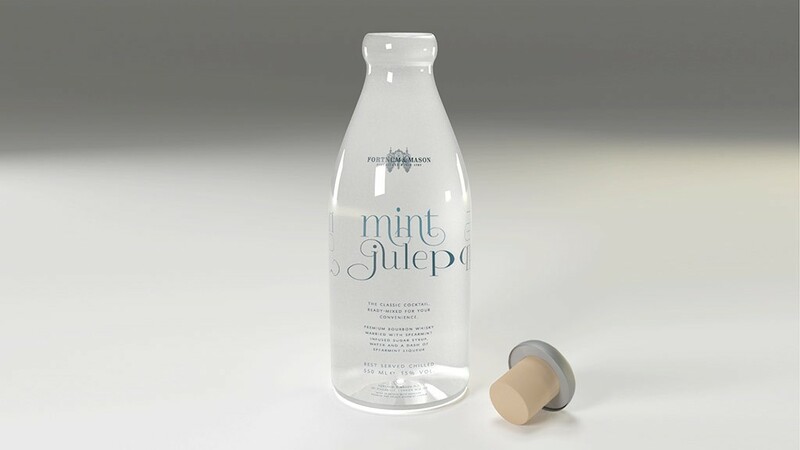 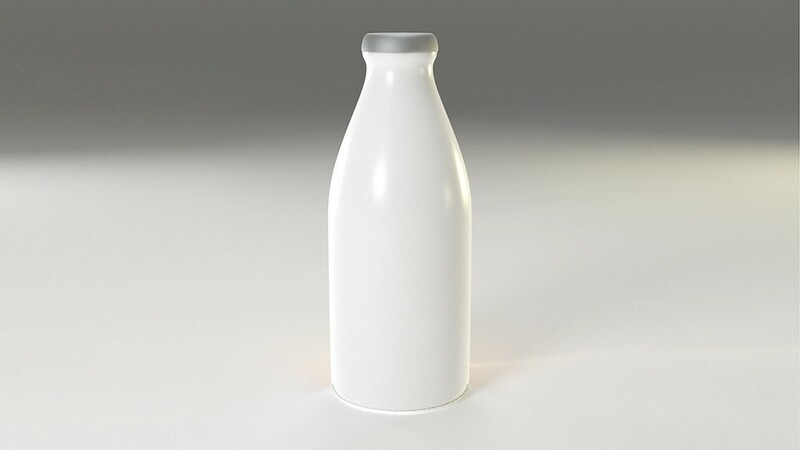 This rationed milk bottle design uses a white glossy film on the underside and 50% of the bottle’s circumference to create the impression that milk is within. The bottle cork’s top section is shaped and coated to make it appear to be a traditional British milk bottle top. When turned around the real ‘black market’ contents are revealed; a ready-mixed mint julep cocktail. 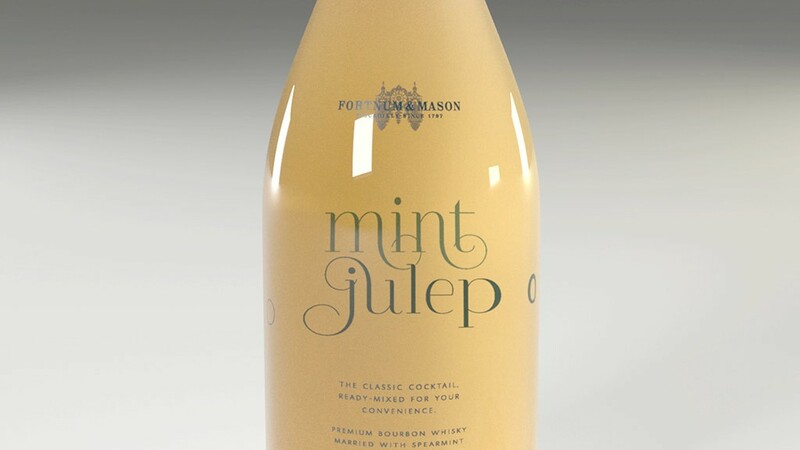 The ‘mint julep’ text is printed on the reverse of the white film, with the rest of the design printed directly on to the glass. 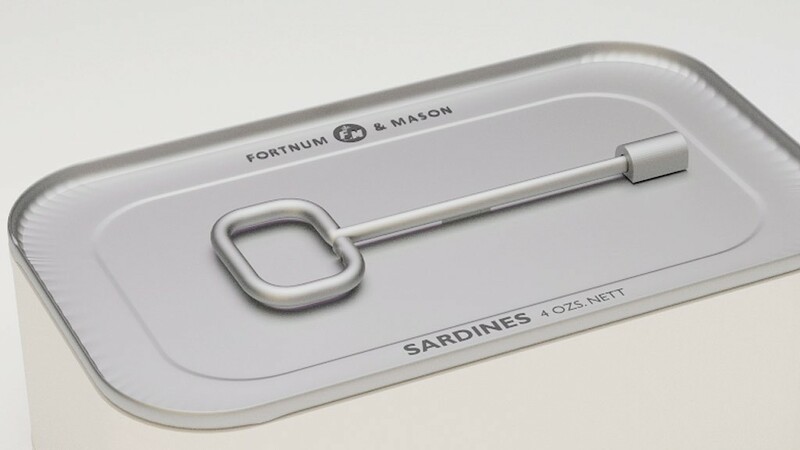 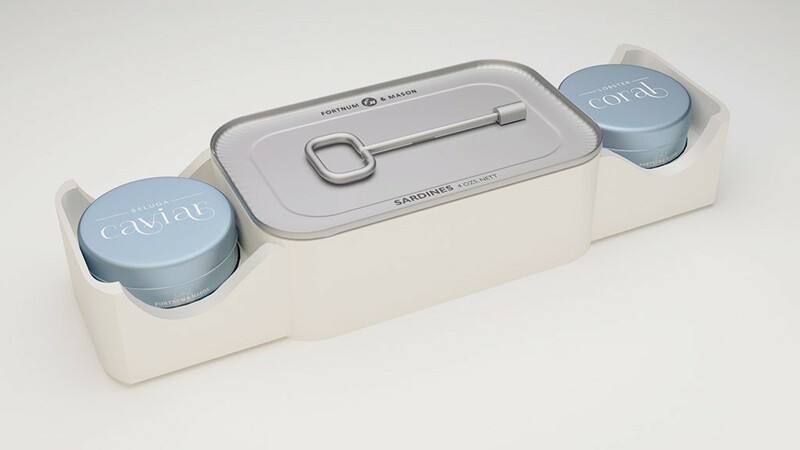 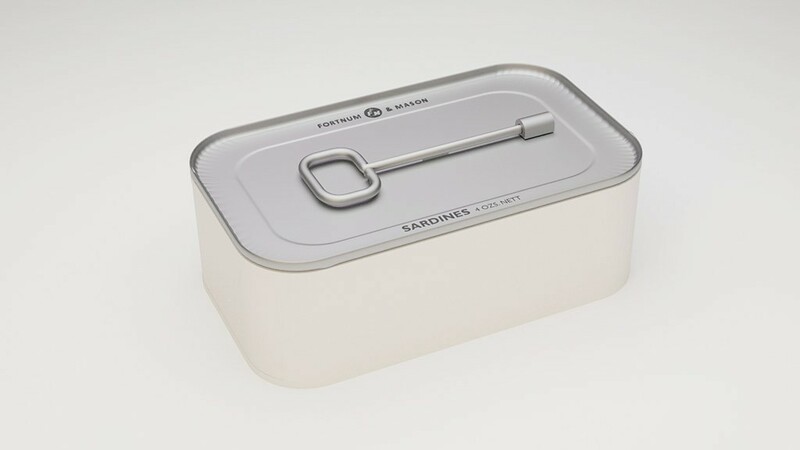 Here a tin of austere-looking rationed sardines, branded with my reinterpretation of the famous 1940s Ministry of Food logo, hides black market goods within. 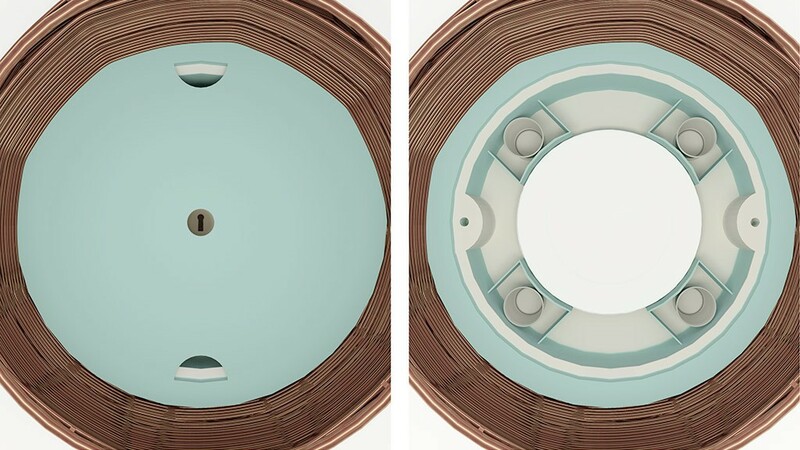 A slight pull on the lightly-sprung key on top softly ejects gas-sprung, self-locking end compartments. 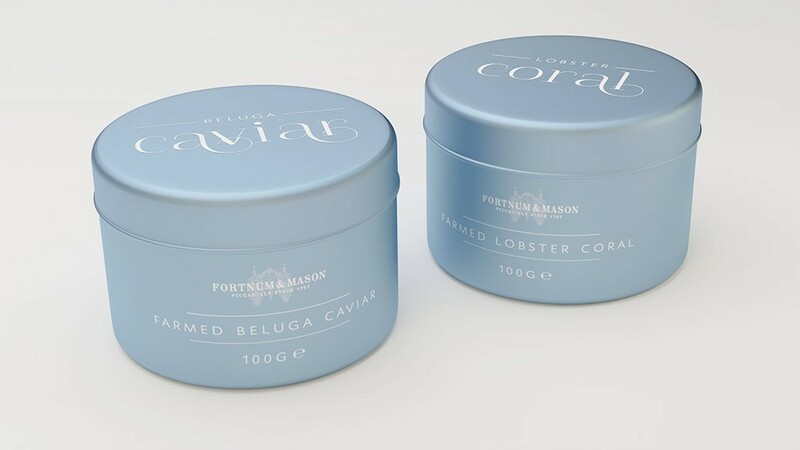 The end compartments contain tins of ‘black market’ caviar and lobster coral. 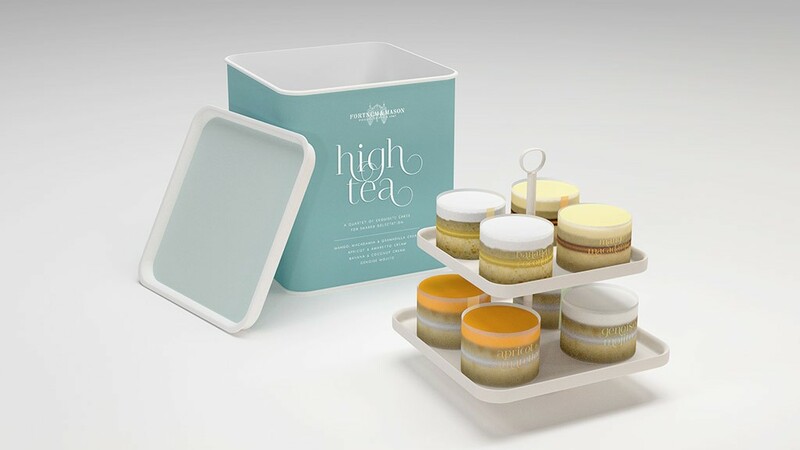 With all the product designs I incorporated extra levels of duality; here the tins have a glossy finish on the lids, and a matte touch to the main body. 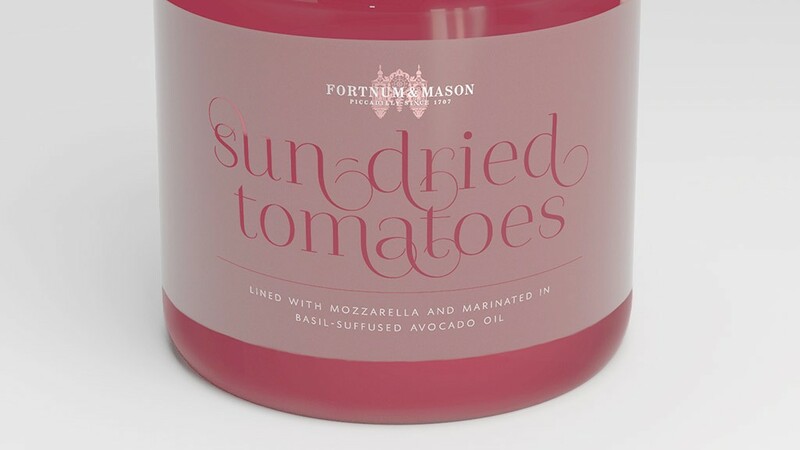 With the label removed, an acid-frosted and direct-to-jar printed design is revealed for ‘black market’ sun-dried tomatoes, stuffed with mozzarella and marinated in avocado oil. 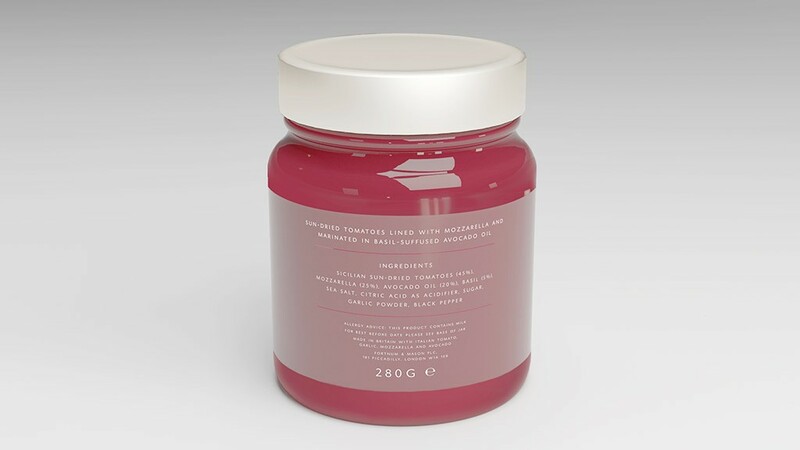 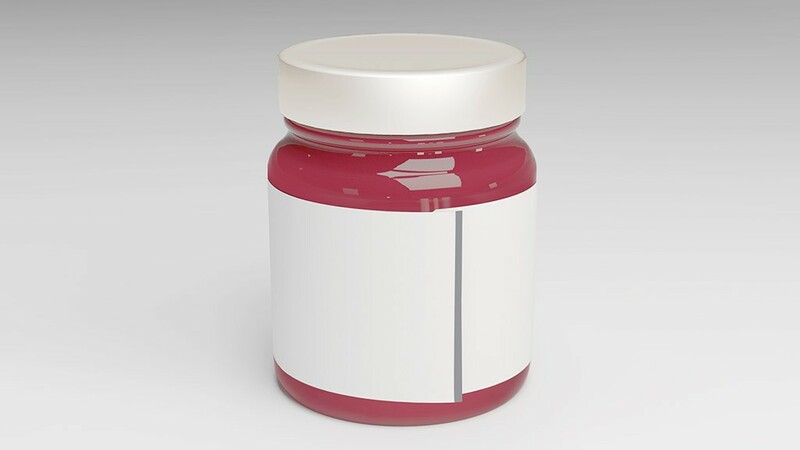 The jam seen does not actually exist – in fact the jar has a thin inner wall containing a red gel to create the illusion, leaving ample space within for the sun-dried tomatoes. 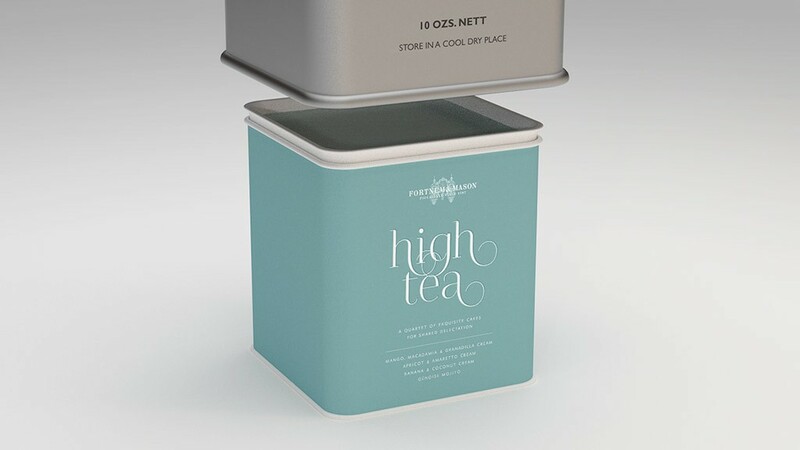 A tin of rationed tea leaves houses an inner ‘high tea’ tin; a press down on the locking top rim of the outer tin releases a mechanism allowing the inner tin to be released. 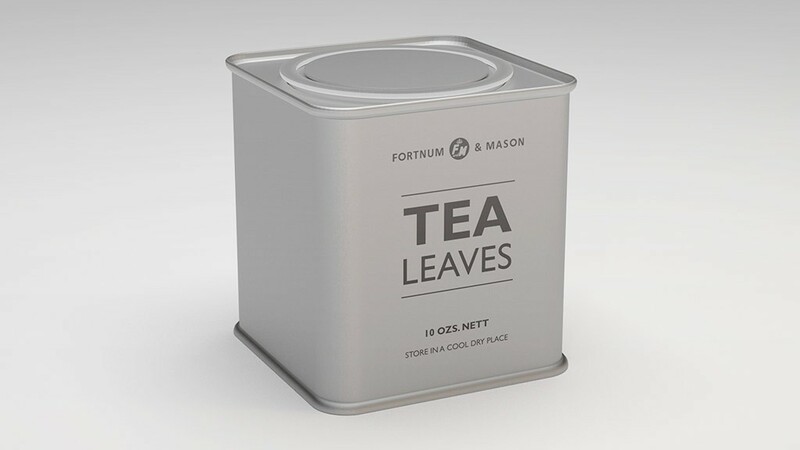 To complete the illusion there is a small chamber containing tea leaves under the outer tin’s lid. 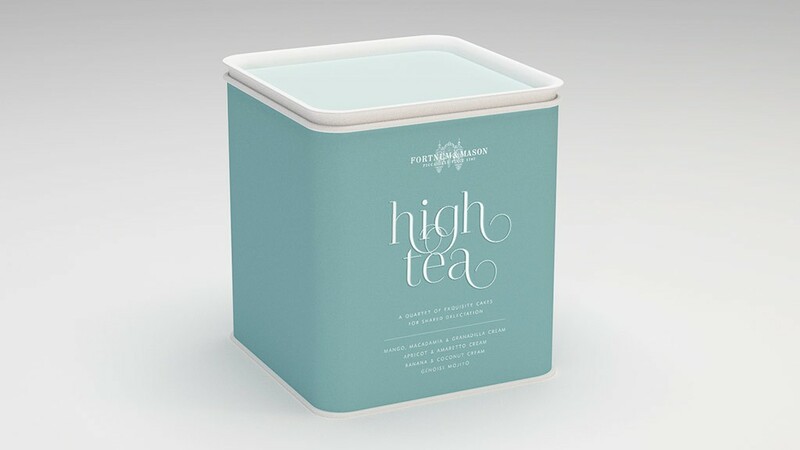 Inside the ‘high tea’ tin is a miniature cake stand, containing four different flavours of ‘black market’ cake; all made using decadent imported fruits and alcohol that would have been impossible to source via rations. 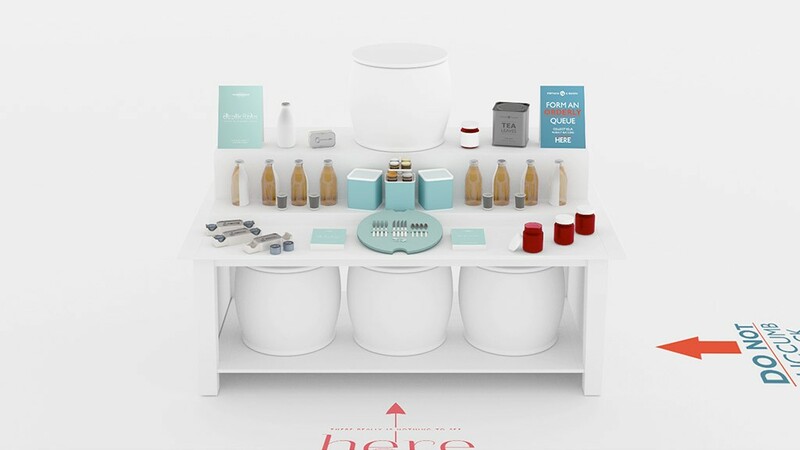 As well as accompanying posters, I created breadcrumb promotions to direct shoppers to the hamper’s point of sale display. 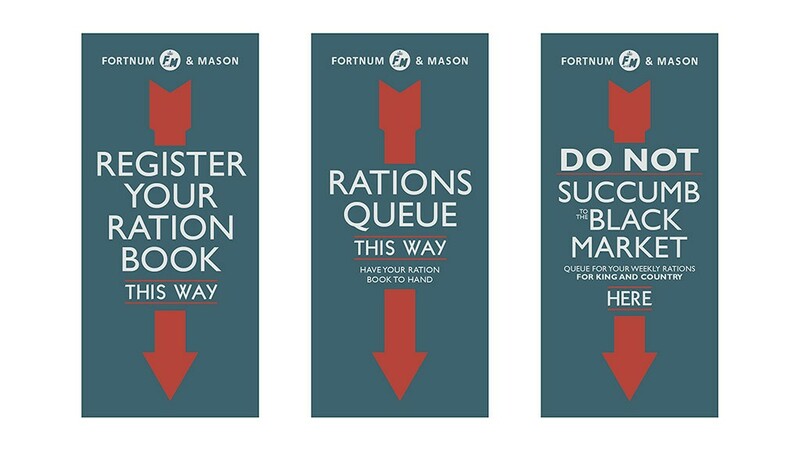 Again utilising a sense of duality, there are ‘black market’ and ‘ration’ hanging banners and floor vinyls, designed to be positioned in close proximity to one another. 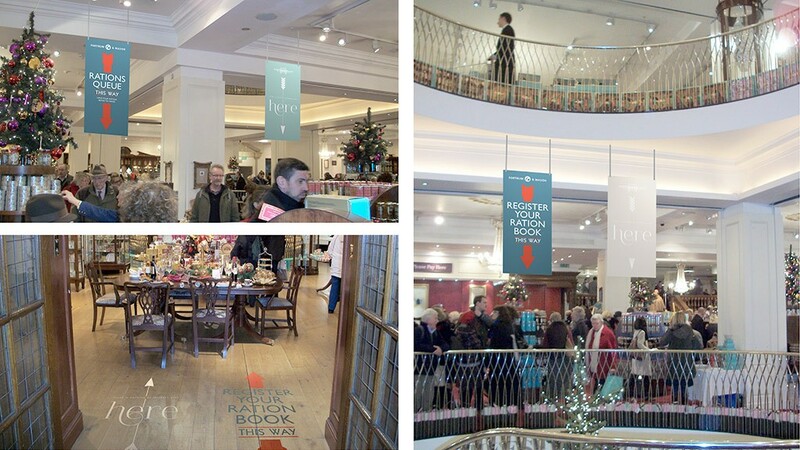 The messages increase in intensity the closer they are to the point of sale display. 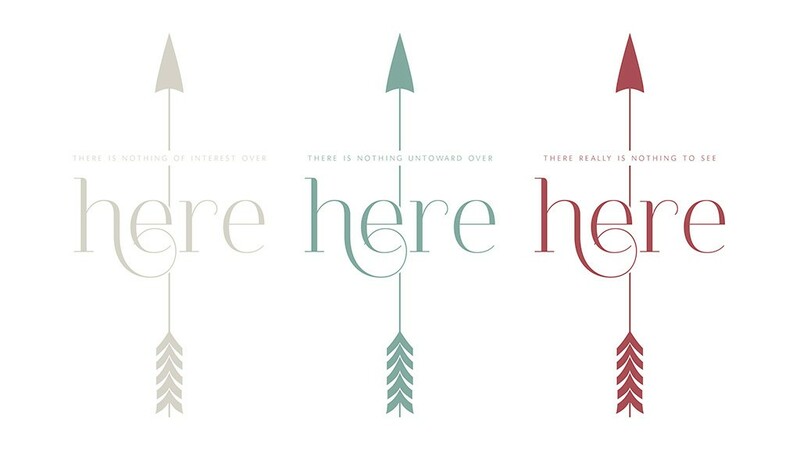 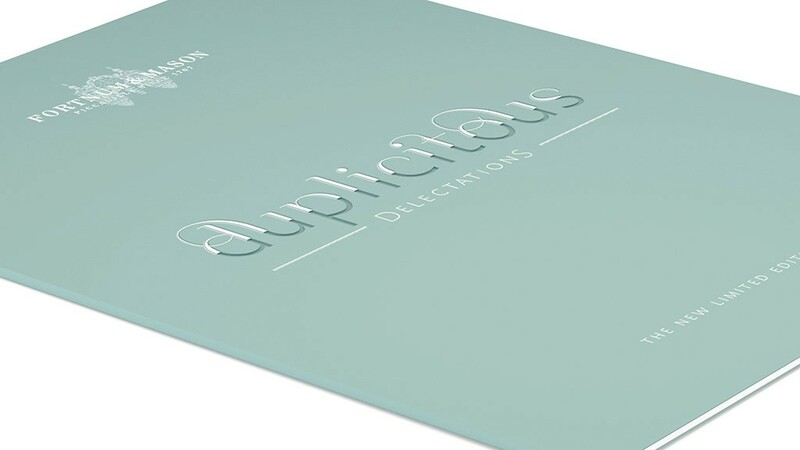 Also produced was an accompanying promotional booklet – which can be viewed here – the cover of which is a mixture of die cut and embossed print.